Access to palliative care depends upon hospital size, location and tax status. 67 percent of U.S. hospitals with fifty or more beds report palliative care teams, up from 63 percent in 2011 and 53 percent in 2008. For the first time no state has a grade of F (defined as less than 20 percent of a state’s hospitals reporting a palliative care program). Important gaps still remain. 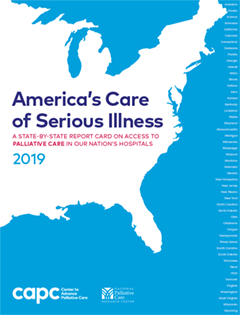 One-third of U.S. hospitals with fifty or more beds report no palliative care services, and one-third of the states received a grade of C or D.
The overall grade for the United States in 2015 was a B, unchanged from 2011. Hospital palliative care teams are often overstretched and unable to see every hospitalized patient who could benefit from their services. According to data from the National Palliative Care Registry™, in hospitals reporting palliative care teams, an average of 3.4 percent of admissions receive palliative care services. Estimates place the need for palliative care, however, between 7.5 and 8.0 percent of hospital admissions. Accordingly, between 1 million and 1.8 million patients admitted to U.S. hospitals each year could benefit from palliative care, but are not receiving it. The availability of palliative care services in U.S. hospitals varies widely by region. For example, in the south-central U.S., no state gained an A or B grade and less than one-third of hospitals in Arkansas, Mississippi and Alabama reported a palliative care team. These south-central regions are most in need of improvement. In contrast, persons in the northeast and mountain regions have almost universal access to hospital palliative care. All hospitals in New Hampshire and Vermont report palliative care programs, as do 89 percent in Rhode Island and 88 percent in Massachusetts. Farther west, Montana, Nevada and Utah earned A grades with hospital palliative care rates of 100 percent, 92 percent and 85 percent, respectively. In 2015, on average 90 percent of U.S. hospitals containing 300 beds or more offer palliative care services. Even in this category of large hospitals, however, where you live matters. For example, in the east and west south-central region, fewer than 75 percent of these large hospitals report palliative care teams (see Table 1). Nationally, hospitals with fewer than fifty beds and sole community provider hospitals are less likely to provide palliative care, with 29 percent and 45 percent of these hospital types, respectively, reporting palliative care teams. Hospital tax status is the most significant predictor of access to hospital palliative care, after geography and hospital size. For-profit hospitals of any size are less likely to provide palliative care services than nonprofit hospitals. Among hospitals with fifty beds or more, 23 percent of for-profit hospitals reported a palliative care team, in contrast to 78 percent of nonprofit hospitals and 59 percent of public hospitals. In hospitals with 300 beds or more, 54 percent of for-profit hospitals report palliative care teams, compared to 94 percent of nonprofit and 93 percent of public hospitals. In the east and west south-central regions, prevalence of palliative care teams in for-profit hospitals averaged 10 percent and 18 percent, respectively. Reasons for differences in palliative care availability in for-profit as compared to nonprofit and public hospitals are unknown.